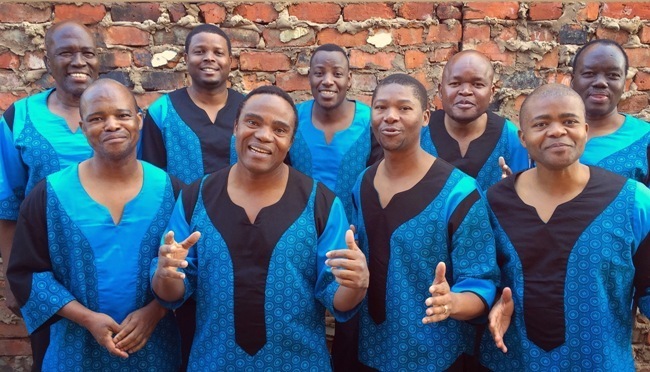 Members of Ladysmith Black Mambazo have invoked the soul of South Africa with their intricate rhythms and harmonies and powerful, uplifting songs for over 50 years. The legendary a cappella male choir has a royal appointment at London's Royal Albert Hall on April 21, 2018, and then headlines at Warwick Arts Centre, Coventry, on May 11 as part of a European tour. The Albert Hall show is a night of music and song to celebrate Her Majesty The Queen's 92nd Birthday. Other guest performers include Sir Tom Jones, Kylie Minogue and Craig David. Called "South Africa's cultural ambassadors" by the late Nelson Mandela, Ladysmith Black Mambazo shot to global stardom after featuring on Paul Simon's 1986 album Graceland. The group was assembled in the early 1960s by Joseph Shabalala, then a young farm boy turned factory worker. Joseph took the name 'Ladysmith' from his hometown, which lies in the province of kwaZulu Natal, halfway between the city of Durban (where members of the group live today) and Johannesburg. The word 'Black' is a reference to the oxen, the strongest of all farm animals, Joseph's way of honouring his early life on his family's farm. 'Mambazo' is the Zulu word for a chopping axe, a symbol of the group's vocal strength. During the 1970's and early 1980's the band established itself as the most successful singing group in South Africa. In the mid-1980s, Paul Simon visited South Africa and incorporated the group's rich harmonies into his massive selling Graceland album, a landmark recording that was considered seminal in introducing World Music to mainstream audiences. A year later, Paul Simon produced Ladysmith Black Mambazo's first worldwide release, Shaka Zulu, which the group recently re-recorded as Shaka Zulu Revisited. The anniversary recorded was named Best World Music album at this year's Grammy awards, while the group's second 2017 album, Songs of Peace and Love for Kids and Parents Around the World), was nominated as Best Children's Album. In 2014 founder, Joseph Shabalala, retired, passing the leadership torch to his sons, who joined Ladysmith Black Mambazo in 1993. Joseph's sons carry the group into the future as they continue to sing of peace and love, with the hope that people will live in harmony. May 18: The Apex, Bury St Edmunds.